All babies of all cultures are precious growing and developing as one human race of beings. As a lover of essential oils, you want to use them for their healing benefits for your baby and young children. But wait—essential oils for babies must be carefully chosen for your little one’s delicate and sensitive skin and internal organs. Essential oils for babies and youngsters must be diluted and not used right out of the bottle. Never dilute the oils with water; use only carrier oils to thin the strong properties of essential oils. Never use essential oils internally with kids or you either. For adults, I suggest the knowledge and wisdom of an aromatherapist. These wonder plants of nature are concentrated, and one drop is equal to 15- to 40-cups of therapeutic medicinal tea. In babies and children, seizures can occur, and they can be toxic to the nervous system. When you use essential oils properly, such as a massage oil applied topically or vaporized, you should be safe. If you want to use inhalants, this vaporizer is a good choice and this humidifier/vaporizer is a larger different brand. The unusual thing about essential oils is that they can be equally calming and stimulating. One person might feel restless while another person might feel soothed using the same essential oil. Adaptogens is the name given to essential oils that adapt to each individual for their needs. You moms want to use products you can trust with your babies. Using essential oils in a non-toxic way gives you self-confidence that your baby is in safe hands—you parents. Use the best brands of 100% pure essential oils that you have learned to trust. Young Living™ recommends these dilution rates. Ages 0-1—8 drops of carrier oil to 1 drop of essential oil and if there is no bad reaction, you can try 7 drops of carrier oil. Ages 2-6—3 drops of carrier oil to 1 drop of essential oil. Ages 7-11—1 drop of carrier oil to 1 drop of essential oil. Do a patch test on your child’s leg or arm and if there is no reaction such as a rash or redness, then you can almost certainly able to use it. Consult with an aromatherapist or medical professional before using essential oils on children under two-years of age. Hot oils such as Cinnamon, Clove Bud, and Oregano should be diluted to 0.5%, and should not be used on children under 10-years of age. As a mom or dad, your kids are going to be sick sometimes and there are things you can do to lessen their miserable feelings. You feed them nutritious food and take them to the pediatrician for immunizations so that they don’t need to suffer from German measles, for instance, in today’s world. There are many essential oils for sick babies and youngsters. Whether they have a cold, a scratch, or tummy ache, use the oils listed below to help your child feel better. Never use essential oils on babies less than 3-months old. Essential oils should not be used by pregnant or breast-feeding women. Use only with a certified aromatherapist or check with your doctor. The limit that is recommended for babies 3+ months old on their skin should not be more than 1 to 2 drops of essential oil per ounce of carrier oil. These two types are good essential oils for babies with colic or constipation. Like lavender, Chamomile is known for its calming properties. It’s also an anti-inflammatory and is good for ear infections. It’s rather costly, so use sparingly. Mix 1 drop in a teaspoon of carrier oil and rub baby’s tummy using clockwise motions to settle him down and sleep. Rub the mixture on baby’s temples and add 2 drops of the essential oil to an ultrasonic diffuser that uses water to dilute without the carrier oil that will clog it. The Plant Therapy® Tummy-Aid Synergy Blend contains the pure essential oils of Dill Seed and Sweet Fennel (Foeniculum vulgare) plus more blends. Mix 1 drop in a teaspoon of carrier oil and rub baby’s tummy using clockwise motions to settle him down and sleep. Lavender essential oil is antibacterial and antiviral to sooth and calm and is useful to boost immunity. Hopefully, your baby will not have a sunburn that Lavender is great on. Blue yarrow is the color of your baby’s eyes or the color of the sky if your baby has brown, green, or hazel eyes. It is a sweet and green herbaceous woody fragrance with a note of camphor that disappears after it’s dry. Be sure to research essential oils you want to use with your baby and young children. The limit that is recommended for babies 6+ months on their skin should not be more than 3 to 5 drops of essential oil per ounce of carrier oil, and maybe less. The orange smelling essential oil is used for topical massages with carrier oils for babies. Skin is sensitive to the sun with Bergamot. Use for calming your baby for a calming nap or at bedtime. Mix 3-5 drops in an ounce of carrier oil and rub baby’s tummy using clockwise motions to settle him down and sleep. Rub the mixture on baby’s temples and add 3-4 drops of the essential oil to an ultrasonic diffuser that uses water to dilute without the carrier oil that will clog it. Only use this essential oil in an ultrasonic diffuser. It is unsafe on skin because it’s irritating. Carefully dilute with a carrier oil such as Jojoba, Grapeseed, Olive, or Almond Oil before using it. Consult an essential oil book or other professional reference source for suggested dilution ratios. Cinnamon Leaf is a better choice for applying to the skin of babies and adults. Plant Therapy® makes their Nighty Night™ blend formulated by Robert Tisserand, the aromatherapy specialist, for children ages 2- to 10-years. Mr. Tisserand’s books offer a plethora of tips for using essential oils. Check out his book, The Art of Aromatherapy on Amazon. This blend contains 100% pure, undiluted essential oils of Lavender, Marjoram, Cedarwood Atlas, Patchouli, Clary Sage, Chamomile Roman, and Blue Tansy safe for kids. Simply apply to your child’s chest or all over the body with a 2% dilution rate using your favorite carrier oil a half-hour before your child’s bedtime. For a soothing bath to calm your child, add 3 drops of the blend to 1/2-cup of Epsom salt and 3 tablespoons of carrier oil to a warm bath. Use your diffuser to run all night long on the 30-seconds on/off mode. 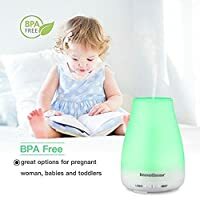 A great ultrasonic diffuser for this that won’t fall off your child’s furniture is the InnoGear cool-mist upgraded 150 mL aromatherapy essential oil diffuser that will run all night and shut off automatically when the water is low. You can read more about the InnoGear here. Your child will love the 7 different colored LED lights and feel better in the morning. Note: Do not use nebulizer diffusers with kids. They use no water and only pure essential oils that are too strong and intense! Rocky Mountain Oils™ makes a super Kids Line Complete Kit that you and your kids will fall in love with. With the convenience of having topical skin safe blends for kids 2-years and older, RMO designed this set for issues facing your child each day. When your child comes home with abrasions from falling off the merry-go-round or swing, or restless sleeping, these oils will come to your rescue. Peppermint is wonderful for easy breathing and any respiratory problems and tummy health for your child 2-years and older. It repels bugs if flies are bothering your youngster. It will cool a fever and act as a decongestant with colds. Be sure to dilute this very strong oil because it goes a long way. Use in a carrier oil such as the ones listed below or put 3-4 drops in an ultrasonic essential oil diffuser that uses water. NOW® Foods has a 3-pack 4-ounces each of carrier oils on Amazon.com® that you can use to see what’s your favorite. I like all 3 of these and many more and they are in plastic bottles. They are a 100% pure moisturizing oil to blend with your essential oils, are nourishing for your skin and your kids too. Jojoba is not only good for your child’s skin, it’s good for the hair as well. It penetrates the skin and closely resembles human sebum (oil). Avocado absorbs quickly and is not greasy. It’s good for dry skin and lips. The high contents of omega 3, 6, 7 and 9 fatty acids can assist with skin problems as well. Sweet Almond oil is 100% pure, is hexane-free, and safe for all sensitive skin. It is a source of vitamin E and phytosterols for radiant skin. It’s useful in your child’s bath and is relaxing. It’s wonderful to remove mom’s mascara and makeup too. If you want a greasy oil, that would be olive carrier oil. I don’t care for the greasiness, but many people do because it soaks in. Remember that essential oils are volatile meaning they will catch fire if close to open flames. Being unpredictable, they can explode. Always keep them in a cool dry place or storage box such as this one on Amazon. Tea tree oil is an anti-fungal and anti-bacterial essential oil. You can use it for cuts, scrapes, burns, bug bites, and as a bug repellent. Mix 1 drop with 2 teaspoons of carrier oil for rubbing on your child’s skin. Use it for healthy hair for your kids with its medium-strength fresh and herbaceous aroma. Eucalyptus is famous as a decongestant for stuffy noses and respiratory problems. It will open airways and clear up breathing issues. It will bring down fevers, is antibacterial and antifungal with a strong woodsy scent being sweet. This essential oil is another adaptogen used for bad breath, colds, flu, and other respiratory distress. Put 1 drop into 1 ounce of carrier oil and rub directly on your child’s temples, wrists, feet, and aching muscles and let the cooling, tingling effect calm after your youngster’s stressful day feeling ill. The Plant Therapy® brand, and there are few producers of the Damask Rose oil from Bulgaria, is excellent. The 100% pure 10% diluted essential oil is high-quality and is beneficial for treating hay fever, asthma, and other allergies your child might have. The dilution is with 100% sunflower seed carrier oil due to the strength of this oil and a little goes a long way. Use 1 drop of oil with 2 ounces of carrier oil. It takes many rose petals to make a bottle of this oil, so it is more costly but worth it. The heavenly rose fragrance is comforting to the senses of all kids and adults as well. It is gentle on the skin used with a carrier oil. Steam will open up cogged sinus passages, help sore throats, and stuffy hard mucus coated nose membranes. This is an old school method that was and still is used for sick kids and it works. Boil a pot of water and add 2 to 3 drops only of 100% pure essential oils after the water is removed from the stove. Sit your child down at a table or in the highchair if younger, cover his head and bowl with a large bath towel and inhale. The towel must cover the face and bowl completely. Put 10 drops of Eucalyptus essential oil into 1 quart of boiled hot water after removing it from the stove. Have your child inhale the steam deeply for 5- to 10-minutes. Be careful that no one gets burned with the hot water. You might want to purchase a humidifier to run in your infant or child’s room at night when they are sleeping. Tea Tree essential oil and 1 drop of Lavender oil to 1/4-cup of liquid Coconut oil. Let it harden and use as needed for a massage at bedtime. It will feel soothing and heal the wound too. Always clean the area with rubbing alcohol, and ohh how that stings, but it needs to be done to remove bacteria and dirt. An invigorating bath for the morning after your baby or child has had breakfast is to put about 5-6 drops of any Citrus essential oil into the baby’s bath tub. Can’t make up your mind? Try the 6 Citrus Sampler Kit shown on Amazon. Mix it up with your hands and bathe your child as you always do using your baby soap and baby shampoo. Rinse your baby or youngster with warm water and towel dry. For do-it-yourself cleaning purposes, bugs out, and more ways to use essential oils without a diffuser, watch this video. You can use any brand, yet the commentator likes Young Living™ as her choice. I hope you enjoyed this article and drop me a note below in comments to tell me what you tried. Did your baby or youngster feel better? What brands of essential oils do you like best and use most often? Remember, less is more and never use added drops of oils. Keep essential oils away from pets and birds. Feel welcome to leave your comments and questions below and I will reply to each one of you. Come back often to our website for more updates and useful information.